Item # 309808 Stash Points: 2,495 (?) This is the number of points you get in The Zumiez Stash for purchasing this item. Stash points are redeemable for exclusive rewards only available to Zumiez Stash members. To redeem your points check out the rewards catalog on thestash.zumiez.com. Protect your face from the elements, or just travel incognito with help from the Obey Creeper Black Bandana. All-black throughout, this bandana features classic "creeper" logo pattern print with a border of Obey script logos for a fresh spin on Obey's classic looks. 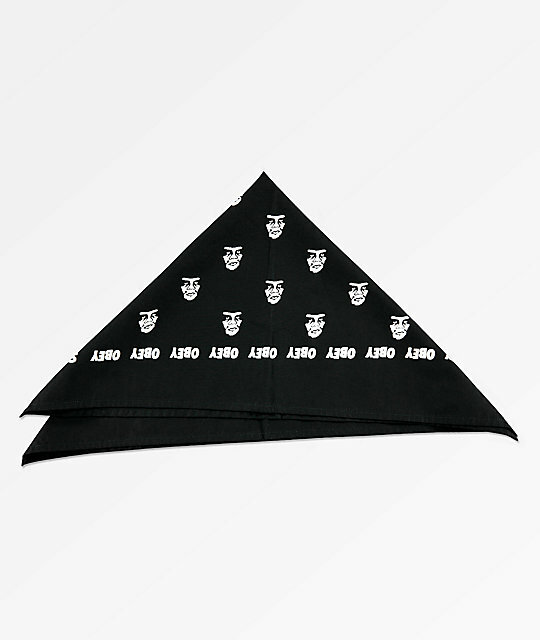 Creeper Black Bandana from Obey. Screen printed logo print throughout. 1' H x 1' W.
30cm H x 30cm W.